never had to look back. 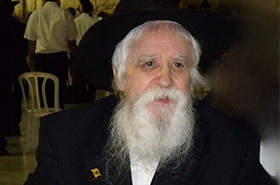 I came to Kfar Chabad when Rabbi Gafne was teaching the ma’amer, Vyedaitaw – Moscow from the Rebbe Reshab. I literally was glowing from this ma’amer and from having found a teacher like Rav Gafne. The greatest simcha one can have is to be free of doubt. Learning with Rabbi Gafne left me without any doubts about the direction my life was taking and my connection to Hashem. In addition to Torah, he taught us the avodah of tefilla. The talmidim who were there in those years took this very seriously. This was due to 100% immersion in the limud and darchai Chassidus that Rabbi Gafne taught so carefully. Rabbi Gafne affectionately call our minyon,” the shleppers minyon” because we would take so long to daven. Rabbi Gafne has always been there for me both while in yeshiva to this day almost 30 years later. I try to keep up a connection via telephone (although not as often as I should). It is still a big part of my life to keep up with Rabbi Gafne’s shiurim. They can be downloaded from the Ohr T’mimim website. I have a long commute and find this to be a very good way to stay connected to Rabbi Gafne and to have meaty d’var Torahs for my Shabbos tish and to share at a farbrengen. As Rabbi Gafne enters this new phase in his avodah, I want him to know that we, his mushpayim, his children, are with Rabbi Gafne now. Anyone one that is capable of helping Rabbi Gafne in this new phase should take it on as a personal obligation, as one would do for his own goshmiusdiker parent. This new phase is wrought with many challenges and adjustments. Hashem should bless Rabbi Gafne and his family, with complete hatzlacha in his shlichus, and may we merit to the geulah shlaima v’emitus NOW!! !